mail@floridanewsline.comIf you don’t count EverBank Field or Jacksonville Memorial Arena, what venues come to mind when you want to see live music and entertainment? To many, especially those who live in St. John County, they are the St. Augustine Amphitheater and the Ponte Vedra Concert Hall. Both are vital to the local community and yet they couldn’t be more different. The St. Augustine Amphitheatre was built in 1965 to celebrate St Augustine’s 400th anniversary as the nation’s oldest permanent settlement. The 16 acre grounds where it was built was an old coquina rock quarry used to supply materials for the building of St. Augustine. Unlike today it was used mainly for showcasing “The Cross and Sword,” a play which ran for nearly 32 years until 1996. After the play ended its run, the amphitheatre wasn’t used frequently, which was a reason $8.7 million was needed to renovate it in 2002. 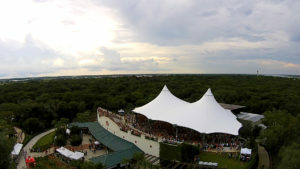 The St. Augustine Amphitheatre reopened in 2007 with new features including the canopy and the new capacity to hold 4,000 people. Unlike the St. Augustine Amphitheatre, the Ponte Vedra Concert hall is a fairly new venue. It was completed in 2011 after two years of renovations. While the amphitheatre was built on an old quarry, the concert hall was constructed from an old church. For years it was the home of Cornerstone Baptist Church until it was bought by St. Johns County in 2009. One of the challenges to converting a church into a concert hall was how the sound would be affected. All of the acoustics had to be updated to give it the beautiful intimate sound you can hear today. The main differences between the two venues are the types of events shown, the size and scope of each, the location and experience. The Amphitheatre had 32 ticketed shows last year versus 70 shows at the Ponte Vedra Concert Hall. While they had fewer ticketed events, the shows were much larger in scale. The artists the Amphitheatre hosts are usually more popular and can expect to attract a larger audience. The Amphitheatre, set on acreage, holds 4000 people, while the concert hall only holds 450 for seated shows or 900 for standing shows..
“The Amphitheatre gives us more flexibility for larger shows. It’s not like we are going to put Bob Dylan in the 900 person concert hall unless he tells us he wants to play a smaller show,” said Dianya Markovits, marketing and community relations manager for both venues. The physical locations of both are also very different. The Amphitheatre is located outside, giving it a more open feel, while the concert hall is indoors with a more close knit feel. The final and most important difference is the experience at each venue. The Amphitheatre is more of an adventure. Getting to the venue requires more walking and parking can be challenging, but the energy is much higher at the venue and it feels like a festive environment. The concert hall is a much lower key environment. There is an intimacy to the experience, as it feels like you can nearly touch the performers. You can park right at the church and it should only cost about $5. “What makes the concert hall special is how insanely close you are. It gives you a really great opportunity to connect with the artists. A lot of the times you see the artists connecting and even talking to the audience,” said Markovits. The St. Augustine Amphitheatre is located at 1340C A1A South in St. Augustine. Visit http://www.staugamphitheatre.com for more information. The Ponte Vedra Concert Hall is located at 1050 A1A North in Ponte Vedra Beach. Visit http://www.pvconcerthall.com for more information. Both venues are run by the St. Johns County Cultural Events division.